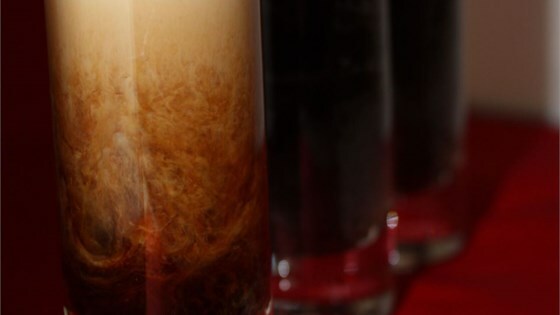 "A delicious shooter that looks like a mini-pint of Guinness. Also learned this one in London." Fill a shot glass almost to the top with coffee liqueur. Top off with Irish cream. It should float perfectly on top making the ''head'' of your shot. A perfect punch for parties, potlucks, and baby showers! We must have done something wrong because it certainly didn't have a head like in this picture. You could barely see the Bailey's at all. We were disappointed but, of course, we still drank it. YUM! We made them with Cafe Patron XO (coffee flavored tequila) and Bailey's. This really does work! Make sure your alcohol is cold before you do this. I shake up the alcohol seperately with ice in my cocktail shaker before pouring. This was a fun treat on St. Paddy's day. We poured the cream on the top over the back of a spoon so it rests nicely on top and it looked great. This is very sweet, perfect for the sweet tooth!